Just Being Frank: I protect the peace. Last night, I was called to duty to protect the public safety of the citizens of St. Paul. They needed me to assist in crime chasing and arrests. And I willingly answered the call of duty. I mean basically. In so many words. Okay really, I decided to do a police ride-along as a part of the Leadership St. Paul program I am involved in. But I was totally critical. I assumed we would spend the night patrolling some random stretch of highway, giving out speeding tickets to poor unsuspecting drivers, but alas, I was wrong. 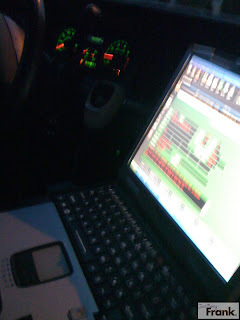 When I got in the car, the first thing my ride along officer told me was that, "I'm not really into traffic tickets. I don't really do that. It's not my thing". Sweet. I like you already, we are going to get along just fine, I thought. And so, after doing some boring stuff (i.e. writing a report on a domestic earlier), we were off. I had a tour of the Juvenal holding cells and detox, and then we hit the road. Jeremy had asked me if we were going to spend the whole night eating doughnuts, and I laughed and told him he was nuts. Not doughnuts...but he did then say he wanted to go get a burger with some buddies. So, we met some other cops at a bar and they got burgers. 3 cops and me, sitting at a table eating burgers. Really wish I had a photo of that one. We (and I say we, because as I mentioned, I was critically important to preserving public safety last night), drove through my officer's district, Frogtown, and then got a call about a drunk guy passed out in his car. I inform the officer that I am strongly interested in a car chase tonight, and we go, lights and sirens to respond to the drunk guy. Turns out, this older drunk guy wanted to get out of his apartment because his mom (whose 84) doesn't like him drinking inside. So, he took his bottle of liquor to his car and decided to drink until he passed out. Sounds healthy. So, my very very nice officer, along with another responding officer offer to walk him back up to his apartment. He is barely able to walk up the hill to his apartment, but they hold him up and walk him home. Nice officers. I don't know if I would have been that nice. Sitting in his car with his keys, that dude could have driven somewhere in a second. Scary. The officers with the drunk guy, before they walked him home. We left, drove some more, and then got a call about a 14 year old who was throwing knives at her mom and brother, and an officer was trying to restrain her. Now we have some action! We responded, and the officer looked at me, and said, "Follow me, stay close" I was going in! We went in and found a hysterical pre-teen fighting the officers and her mother. I am still unsure of what her problem was, but she was clearly over emotional and needed help. 6 officers and myself responded and we stood in this family's home trying to get this girl to calm down. Her aunt was convinced that I was the new chief of police, and my ride along officer played along and said, yes, yes she is. The first female chief of police ever, standing here in your house. They managed to calm the girl down somewhat, and we left her with a couple of other officers. Off to the next call of duty! We drove around some more, yelled at some guy for selling CD's on a corner and stopping traffic, and then we got the big one. An armed robbery and runaway. To make a long story short, this guy robbed four shops in St. Paul and several officers were chasing him. While he was running away he jumped into a van, and then when cops were following the van, he jumped out and ran away again. We caught the van driver and passenger and held him in the car, with me! As about 10 other officers and several K-9's searched the area for the suspect, I entertained the van driver in the police car. And...let's just say he was not terribly pleased to be joining me on my ride along. He was not such a willing participant in the program. I think my life hit a high note when I turned to the suspect, who would not stop screaming in the back of the car and said, "Knock it off, I am sick of you". Yes, I preserved the peace. But seriously, this guy was driving me nuts. Quite an eventful night, got home very late due to the armed robber, all in all an unbelievable experience. If you have never done this, do it now! The police need you like they needed me. Hilarious. But I'm dying to know: what does one where to a ride-a-long? Well you see...I was told not to wear gang colors. And well, I don't exactly know what gang colors are, so I wore linen khaki's and a teal shirt. I figure gang's don't wear linen or teal, unless it's the JCrew gang. Wow! That sounds pretty exciting! Did they ever actually catch the robber? The JCrew gang. I hear they have a war going on with the Banana Republic Gang. Seriously the ride along sounds like so much fun!!! !